If you spent the better part of fall making yourself sick on Pumpkin Spice Lattes, you're in luck: Starbucks just brought back its annual holiday drink menu, which means a whole new set of drinks to swap into your rotation. As always, this year’s crop is once again teeming with all the sugary-sweet concoctions we know and love (Eggnog Latte? Check. Chestnut Praline Latte? That's back, too). But as tempting as they may be, these seasonal drinks are just one of a zillion holiday treats determined to turn those toned abs into a shaking bowl of jelly. While it's the season to indulge, not every drink needs to demolish all the hours you spent sweating away in Jazzercise class. 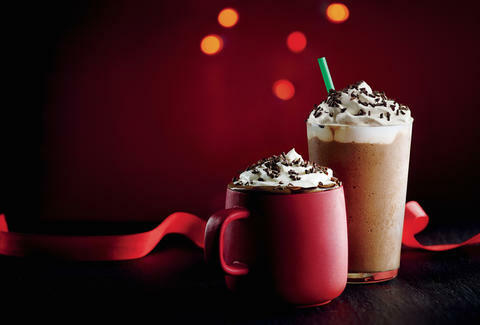 None of Starbucks' holiday drinks are healthful per se, though some are definitely healthier than the rest. Stick with a tall (12oz) Gingerbread Latte if you want your liquid holiday fix without an extra shot of guilt. 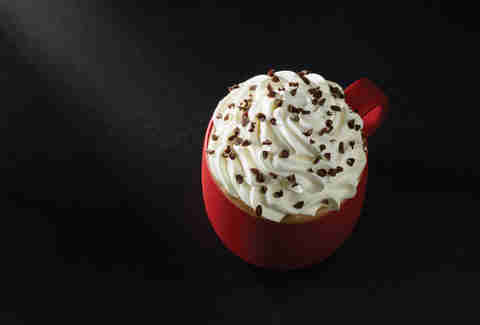 The Gingerbread Latte weighs in at a cool 260 calories and 11 grams of fat. Compare that to the menu’s heavier hitters -- like the 350-calorie chichi Caramel Bruleé and the 360-calorie milkshake-esque Eggnog Latte -- and the numbers speak for themselves. If gingerbread just isn't your thing, the nuttier Chestnut Praline Latte comes in second, with 270 calories and 11 grams of fat in each 12oz pour. But like everything at Starbucks, all of the holiday drinks are super-customizable, meaning with a few swaps, you can make even the Eggnog Latte a less indulgent treat. Follow these ingenious barista-suggested calorie hacks and you might even find yourself taking Aunt Sally up on that second slice of pecan pie, 100% guilt-free. Make it skinny: Sub in nonfat milk for 2% and you’ll substantially lower calories and fat while still retaining 30% of your daily calcium needs in each 12oz cup. Go sugar-free: Most flavored syrups are available in sugar-free form, so opt for those when sweetening your drinks. Limit your syrup intake: One-pumps, half-pumps, and quarter-pumps of flavored are all fair game. Request less whip: Asking for just a bit of whipped cream instead of the standard mound can save you 80-110 calories depending on the type and size of your drink. Downsize your drink: What’s smaller than tall? Short! Switch to an 8oz pour of any Starbucks drink to lower calories, fat, and sugar without taking flavor out of the equation. Lighten up your Frapp: Ask for a “light” Frappuccino and you’re looking at at least 33% fewer calories than the OG. Meredith Heil is a staff writer at Thrillist. She's about to cop a Starbucks, she reversed on my hard luck. Now she's at the dealer buying car trucks, awww shucks. Split a Frappuccino with @mereditto.